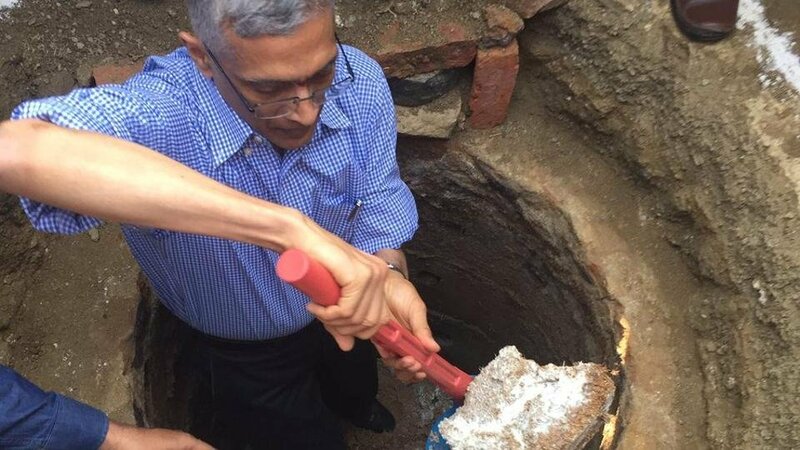 This IAS Officer Has Set an Example By Emptying A Public Toilet Pit in His Bare Hands! Government offices and Government officials are not usually looked upon as inspiration in India, our notions about them are strongly influenced by the experiences we have in government offices. May it be corruption, may it be a delay in implementation, usually, government offices and officials are in limelight for all the wrong reasons. However, some officials and offices go beyond and above their call of duty and become role models for others to follow. Here is one such story of an IAS officer who made a commendable act to set an example to others. Let us introduce to you Mr Parameswaran Iyer a senior IAS officer and the Secretary to the Union ministry of Drinking Water and Sanitation. He decided to take issues into his own hands ( Literally!!!) and let many people in awe. He decided to set an example by getting down into a twin toilet pit and empty it with his own hands. Parameswaran Iyer accompanied by a group of 40 bureaucrats, 23 principal secretaries and representatives from UNICEF were at Gangadevipalli in Warangal district of Andra Pradesh on February 18. They were there to study the twin pit toilet technology which converts human faeces into manure over a period of time. This is a part of the Government of India’s famous Swachh Bharath Campaign. But Mr Iyer realized that they were facing a challenge. The challenge of Casteist oppression. In the rural parts of India clearing toilets and cleaning faeces is considered dirty or menial work. Iyer had to set an intelligent example for others to follow. He decided to clean the toilet on his own. The villagers and bureaucrats watched him clear manure with bare hands in awe. In some time other bureaucrats joined in to help him. This action of dedication and passion for work from Mr Iyer received appreciation from people around, even Prime Minister Narendra Modi appreciated the deeds of Mr Iyer and thanked several organisations and the government for carrying forward the campaign with dedication on his 29th episode of Mann Ki Baat. These acts of being brand Ambassadors of clean and healthy India by top Bureaucrats will go a long way in making people aware of the importance of cleanliness and removing the shadows of casteism associated with cleanliness in India. Mr Iyer features in this episode of People who make India proud. Hats off to your dedication sir.